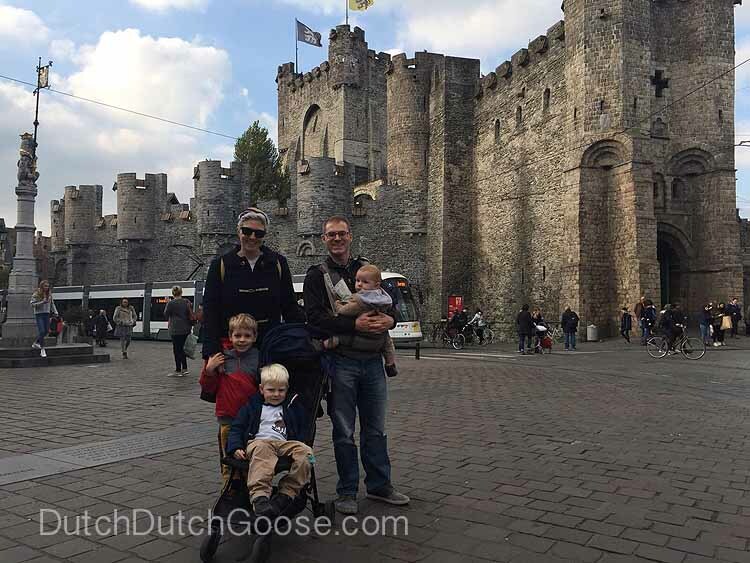 Ghent should be on the top of your Belgium visit list! It was our favorite of the large Belgium towns and made us wonder why we didn’t get here sooner. We made an Autumn weekend visit, driving down on Friday and heading home on Sunday. We had ample time to enjoy the city, but were completely charmed by everything it had to offer. It was cold and rained a bit during our November visit, but Ghent seemingly oozes charm year-round. We used the CityCard Gent which honestly added to our enjoyment of the city. The card includes almost everything in the city including public transportation, boat trips and a one-day bike rental. We took full advantage and racked up a great weekend in Ghent. The CityCard is easily picked up at the Tourist Office downtown and is reasonably priced. We stayed at Hotel Onderbergen, a boutique hotel with an amazing location in the center of the city. The hotel has a few parking spots (think 4), so we reserved one in advance (10 EUR per day) and had access to our car all weekend. We were also able to safely store our rented bikes at the hotel. As soon as we left the hotel we headed right for the old town center to the Cuberdon cart, which I had seen a million pictures of on Instagram. We each picked a color and tried one of these local treats. These cone shaped treats look like noses and taste a bit like jelly beans. They’re most commonly filled with a raspberry filling. Honestly, none of us were fans but they weren’t disgusting either. You just have to give them a try! We also climbed to the top of the castle towers for stunning views of the city. The only better view in town is from the Belfry. As the largest tower in Belgium it sports amazing views. The Belfry tower even has an elevator, if climbing up and down the stairs is not for you. The Belfry tower was used as the city’s watch tower and the bells were essentially the communication system for the town. Try to be on the top floor at the top of the hour so you can see the bells ringing. First, the bells chime marking the hour then the city’s anthem plays using this programmable wheel. The kids were fascinated by the gears and moving strings connected to the bells. Jeff’s largest “must do” in Ghent was seeing the Adoration of the Mystic Lamb, included in the CityCard. This piece of art was featured in the movie, Monuments Men. Turns out it’s actually quite difficult to see. We were thwarted several times in our attempts to see the piece. We finally saw it on Sunday afternoon when it opened at 1pm. The piece is truly stunning and worth visiting. Jeff remarked that it’s larger and the colors are more vivid than he expected. The 50 min audio guide seemed useful – but the art is in a small room so the people listening to the audio guide looked bored. The Cathedral that houses it, St. Bavo’s is full of other treasures which are all free to view. We were most mystified by the full skeleton of a whale that hangs in rear of the church. If anyone knows why there’s a whale in St. Bavo’s, please let us know in the comments. There are also 22 side chapels in the church that all house incredible works of art. One side chapel houses a replica of the Adoration of the Mystic Lamb so you can pop over (right side when facing altar) to see it through a gate if you don’t want to pay to see the real deal. The kids had had enough “culture” for the day so we headed to the Gruut Brewery. We used public transport (tram), even though it’s easily walkable, since it was free with the CityCard to give us all a little downtime. The Gruut Brewery uses a mixture of herbs, in the tradition of medieval brewers instead of hops. It was a bit chilly, but we ordered some sausage, cheese and a tasting platter to enjoy while the kids ran around in the neighboring park. The beer was perfect. Just across the street is The Holy Food Market. We couldn’t have asked for a better dinner option with the kids. The 16th century church has been turned into a food market with amazing options. The Little Little was happy in one of the available stokke trip trap high chairs. We all easily found options we could enjoy. There are a half dozen or so restaurants inside, all serving different food genres. The Middle Little was delighted with his bread and cheese platter. The Big Little and I split some wonton soup and spring rolls, which I complimented with a sangria! Everything we tasted was outstanding. The atmosphere is cheeky and fun. An evening stroll back through town delighted the kids. The City Pavilion, which seemed strange during the day, delighted us at night. Over 1600 glowing tiny windows made it look magnificent. We also popped into the old post office that has been converted into retail space. The interior architecture is preserved so it’s worth checking out. Ghent prides itself in its award-winning nighttime lighting scheme. It is magnificent and worth a stroll. The next morning we returned to rent bikes directly under the pavilion. The CityCard covers the basic bike rental (a city bike) for one day. We called ahead and also reserved the three wheeled Christiana cargo bike (not covered by the CityCard, 25 EUR per day + 90 EUR deposit). We added a backseat to the city bike since the cargo bike straps were just a simple lap belt – not enough to contain the Little Little. The bike rental was for 24 hours so we weren’t rushed to return the bikes the same day we rented them – perfect! Ghent also has free strollers you can borrow for your visit. These signs show where they can be picked up and dropped off. A reservation can be made online. We had breakfast at Julie’s House, which was tasty but underwhelming. The schedule is complicated. Full breakfast is served only on weekends, only with a reservation and they have two seatings. (The “healthy breakfast” is served on Wednesday and Thursdays.) The cafe is cute as can be, but we arrived a bit after 9am for our 9am reservation and they seemed to just be getting to work. The food was fine but portions small for the price and our pancake were undercooked. They had a baby chair for our Little Little but it could not be properly installed on any of the chairs they have available. We did grab a carrot cake cupcake on our way out and it was tasty! So maybe skip breakfast here and pop in instead for a piece of cake. Julie’s is cash free. On our bike ride we found ourselves outside Saint Peter’s Basilica so we popped in to view the church. St. Peter’s is one of those huge churches you are instantly in awe of. Next door is St. Peter’s Abbey, a museum which hosts rotating international exhibits. We popped in to enjoy the gardens and vineyard. The kids loved running in the grass. It’s hard to remember you’re in the center of the city back here. There are ruins to explore as well. Just down the street from St. Peter’s is Mayana, a chocolate cafe you’re not going to want to miss. They have a variety of options with the common theme that everything gets dipped in chocolate. The next stop was STAM, the Ghent City Museum which is also part of the CityCard program. They have two great exhibits your kids are sure to enjoy. The first is a huge map of Ghent. You don shoe protectors and have the chance to walk over a huge aerial map. My kids loved this. The map loving Middle Little pretended he was a car and followed the highways and roads through the city. We spotted sheep and looked for playgrounds. If we had brought along a matchbox car the boys probably would have never left. Yeah, I’ll say that again. PRO TIP: Bring Matchbox or HotWheels cars. The City Museum also has a Lego table where you can build your own architectural models while gazing at Ghent’s architectural highlights made out of Legos. We’ve seen this Lego table idea in a few other museums too, but it’s always a winner. I even sat for a while with the big kids and enjoyed some quiet building time. I even told Jeff I want to just purchase only white Legos so we can have this table at home. I’m only sort of joking. We grabbed lunch at the STAMCafe. We made a reservation right when we arrived at the museum for an hour later. A reservation was necessary as the place was packed throughout the day. The food was excellent. Jeff enjoyed the daily quiche (spinach), I opted for the vegetarian wrap and the kids split the bruschetta plate (served three ways). The STAMCafe has Ikea high chairs and a toy box, making it a great choice for kids. The Design Museum is right in old town Ghent. The Design Museum was on our radar already because hidden throughout their otherwise adult exhibits are PlayMobil people. Children are given a worksheet to find the PlayMobil people throughout their visit. This seemed like a wonderful option that we could all enjoy. It looked like you get a button or similar if you finish the sheet. When we learned the Design Museum was hosting an exhibition on Robots, we knew it would be a slam dunk. We all thoroughly enjoyed the Hello Robot! exhibition. The kids were given a lovely pamphlet to work through each room of the exhibit. They had real robots working as part of the exhibit, in addition to toy robots and robots from television and film. We popped into a chocolate shop for a much needed post museum pick-me-up. The streets were crowded at this point and current construction projects made it a bit difficult to ride the bikes through town. We all had a bit of chocolate and instantly felt better. We decided we hadn’t quite packed enough into our day so the Big Little, Middle Little and I used our CityCards for a 45-min boat tour. The CityCard includes most of the boat companies in Ghent, but we opted for the boats covered with the umbrellas since it was raining. The boys loved that the umbrellas automatically lower when going under the bridges! The tour was given in English and although it was little snippets about the town, I always love seeing European cities from the water. The 5:15 sunset meant we got to see the city during the magic hours. Everything looks amazing with the lights on, but it’s not quite dark out yet. It wouldn’t be a trip to Belgium unless we grabbed some fries and a waffle. (We did this while we were waiting for the boat tour with the added bonus of no one asking for snacks on the boat.) There are tons of tourist shops on the main square, but we followed the locals for a reliably good option. You can plop nearly anything on a waffle like strawberries, chocolate, sprinkles and whipped cream but we are purists and enjoy them plain. After the tour we saw a bit of the city all lit up on the bike. It really is just such a charming city! I biked the boys back to the hotel after the boat ride where we met up with Jeff who had ordered pizzas to enjoy in the room. We all got a little bit of downtime and enjoyed the cozy room while it poured rain outside. We took advantage of the rental bikes Sunday morning by biking through some of Ghent’s parks. We found a playground to burn off some of that early morning energy and an open bakery for breakfast. We returned the bikes at 10am when the store opened on Sunday and enjoyed a walk through town. We opted to grab some soup at Soup Lounge for an early lunch. You choose one of their four daily soups and it comes with bread, a piece of fruit and mix-ins. The price is 5 EUR (4 EUR for a children’s portion). Plus if you sit upstairs you have a wonderful view over the river and into the main market square. Our last stop was The World of Kina: The Garden, a nature center and children’s museum. There was a worksheet scavenger hunt (in Flemish, but Google Translate was a winner) for the kids and they each earned a prize. The boys loved the microscope that was hooked up to a computer. There were a variety of bugs to view. There were also play objects out in the garden like this water wheel that captured their attention. This was a great stop on the way out of town and resulted in sleeping kids on our easy drive home. We were provided Ghent CityCards in exchange for this post. As always all opinions are our own.